Electric cars have come a long way in the past decade or two, but one glaring problem remains: you have to charge the dang things. What do you do when there aren't enough charging stations (and there aren't)? If you're Ford, you build a car that charges itself. 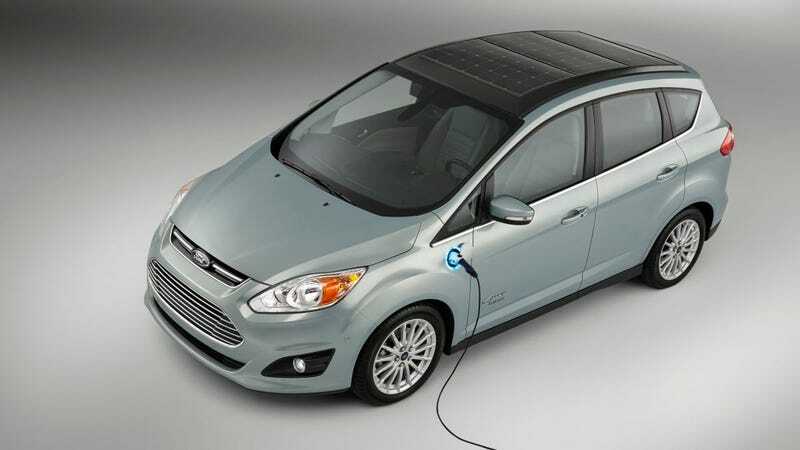 Behold, the C-MAX Solar Energi Concept that Ford just unveiled. This beast is equipped with a rooftop 16-square-foot solar panel, built by Silicon Valley's SunPower, that charges a lithium-ion battery pack. It's meant to be paired with a solar canopy that beams sunlight directly onto the panel so that the car can charge in six or seven hours. As such, the car doesn't need to be plugged in and can operate completely off the grid. Now, the design is not perfect. The car's range is only 21 miles—which is fine, if you want to use it once a day to drive to a nearby grocery store, but otherwise pretty annoying. Mike Tinskey, Ford's director of global vehicle electrification and infrastructure, told Quartz that the car "could be for the home, corporate campuses or developing countries where there is no grid." There's a gas engine, just in case.